A spicy kicked up fire roasted Mac and Cheese recipe featuring Cabot Creamery’s new shredded cheeses. I have been so excited to share this recipe with you for quite some time. I’m going to say, testing this recipe over the past month is the reason I’m not totally beach bod ready this season…but I’ll also share that it’s been totally worth it. Cabot Creamery, my favorite dairy company, recently introduced new shredded varieties of their cheeses and I’ve been ALL IN. They have 15 new shredded cheese varieties, including my favorites “Fiery Jack”, “Two State Farmers”, and “Rustic Pizza”. If you follow me on Instagram then you’ve probably noticed that Cabot’s Fiery Jack shredded cheese has been making it’s appearance in many of my meals lately. I can’t get enough of this blend of Habanero Cheddar and Monterey Jack cheese. It adds the perfect spiced up kick to burgers, pasta and more! This fire roasted mac and cheese is one of those things you just can’t stop eating. In fact, the last batch I made we had for dinner while my oldest son was at work. There was over half a casserole dish left when he got home. I mentioned I’d left some dinner on the table for him. He heated up the ENTIRE remaining pan and ate the whole thing. Oh to be 16 again with that kind of metabolism. 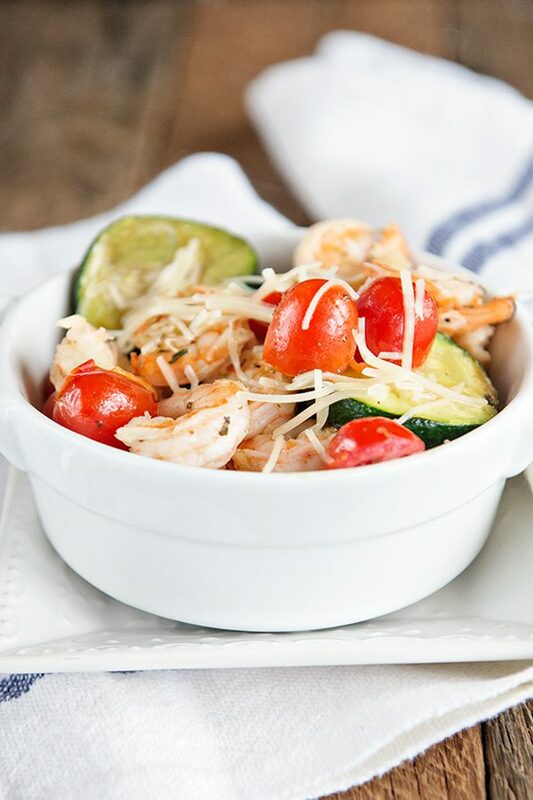 My entire family keeps raving about how much they love this recipe! Even with the peas in it! 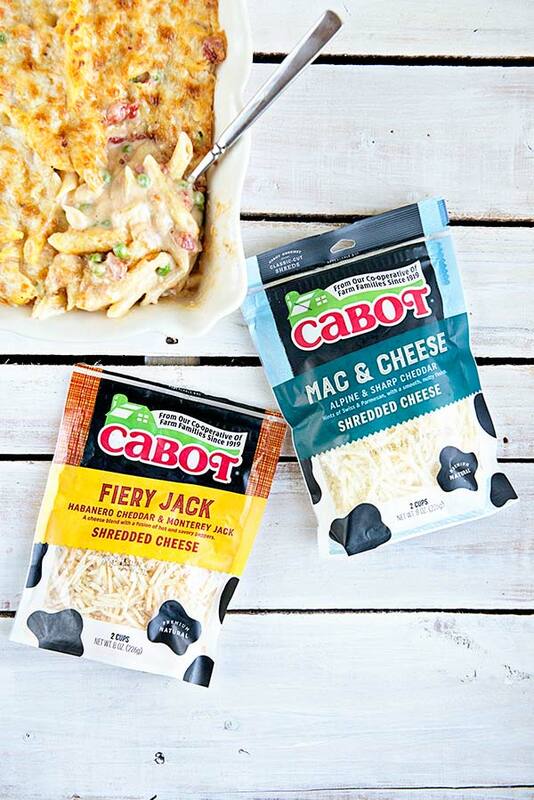 If you are looking switch up some of your favorite recipes featuring shredded cheese, I can’t recommend trying Cabot’s new shredded cheese varieties out. With so many choices of flavors, you can make one recipe a variety of different ways and enjoy something new each night. Also, don’t worry about the beach body. Give this recipe a try again and again and you’ll soon talk yourself into realizing beach bodies are overrated. Creamy cheesy pasta goodness is way better. Enjoy! To check out all of Cabot Creamery’s new shredded cheese varieties, visit their website. 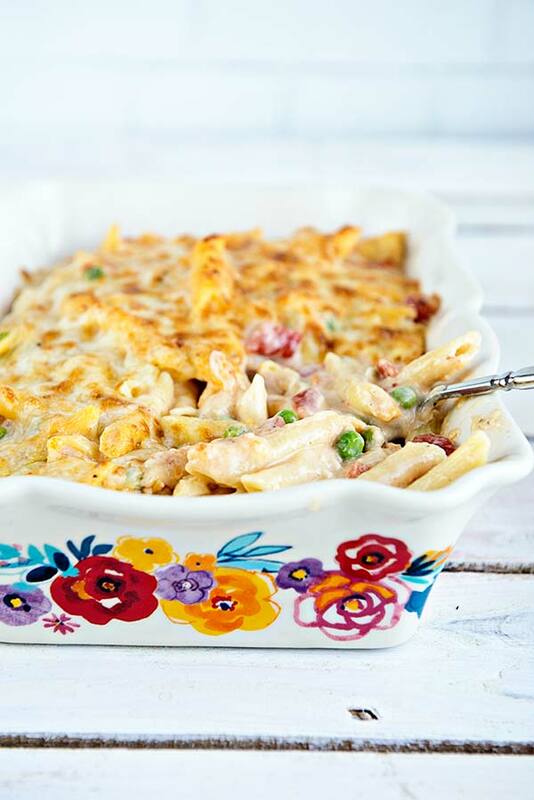 You can also find plenty of awesome recipes featuring Cabot Cheese, by clicking here. Mac and Cheese gets kicked up a notch with fire roasted tomatoes and Cabot Fiery Jack Mac and Cheese. In a large stock pot, cook pasta according to package directions. Drain and set aside. Preheat oven to 350°F. Prepare a 9x13-inch glass baking dish with cooking spray. In the same stockpot you used to cook your pasta, melt the butter over low heat. Add garlic and cook for 30 seconds. Whisk in flour and salt and continue whisking until smooth (not lumpy but will be thick). Increase heat to medium and slowly whisk in milk and whipping cream. Heat to boiling, stirring continuously. Boil for one minute while stirring. Lower heat and stir in 2 cups of Fiery Jack cheese and 2 cups of Mac and Cheese cheese. Cook just until melted. Remove from heat and stir pasta, fire roasted tomatoes and peas into the cheese mixture. Stir in beaten eggs. 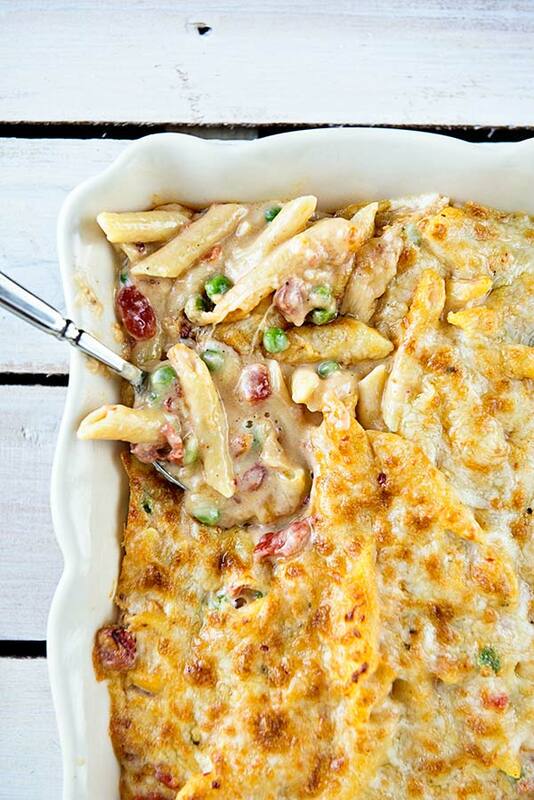 Pour pasta into the prepared casserole dish and bake for 20 minutes. Once the 20 minutes is up, change oven setting to broil. Add remaining 1/2 cup of fiery jack cheese to the top of the pasta and place under the broiler for 5 minutes, or until browned on top. Remove from oven and let cool for 10 minutes. Enjoy! Disclosure: This is a sponsored post on behalf of Cabot Creamery. All opinions expressed are my own. Kristen, definitely going to give this recipe a try! It seems like it would be a welcome addition to a summer potluck!! Thinking about tossing in a bit of chopped grilled chicken, too. Yum!! Thank you for sharing your hard work. Can’t wait to taste it. Oh yes!! That would be so good. Or bacon! 😍😍😍 Thanks for visiting! 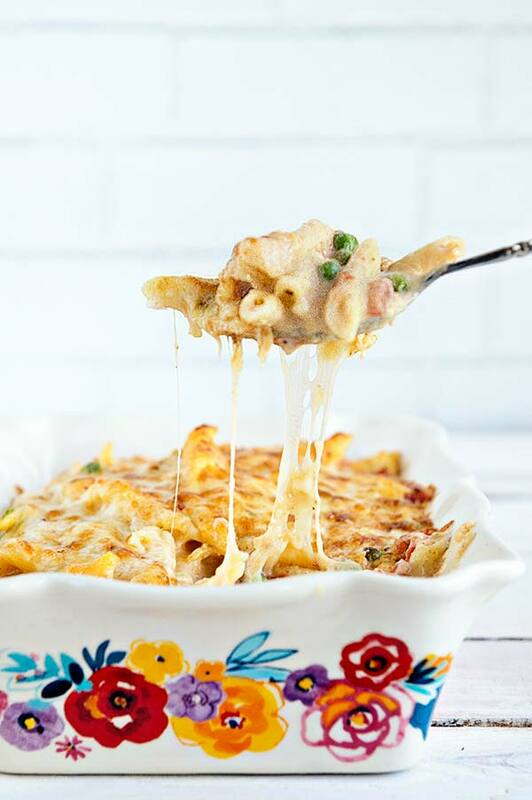 Looks so so good – I love cheese …esp SPICY cheese! Are these cheeses available at all grocery stores? Hy-Vee currently has some of the varieties but what they have seems to change often. I haven’t seen them at Price Chopper yet but put in a request with the manager so fingers crossed! Yum yum yum! Can’t wait to make this and eat the whole thing! I’m just kidding, but I do think it’s that delicious! I love the dish you used for the photo! So cheerful! This sounds delicious. I got to try those cheese since you are saying it is so good till you cannot stop.